This sales development thing might have some legs after all. At least that’s the indication from the second annual Rainmaker conference hosted by sales enablement software provider, SalesLoft. This year's conference more than tripled attendance (more than 600) from their first conference last year (175 attendees). The attendance wasn’t the only indicator. Even more important was the increased depth and focus of the companies implementing sales development strategies. For readers not familiar with sales development, it is a specialized, dedicated function for prospecting. Integrating email nurturing, with outbound calling and data and analytics, it enables companies to accelerate and scale growth by increasing the velocity and predictability of sales qualified leads (SQLs). Once again the conference brought a slate of the leading thinkers and practitioners that are at the forefront of this strategy. As I listened, I was struck by the advancements of the last year, and the insights of a discipline that is still very young, but clearly in its maturation period. Last year I left with 5 key takeaways; this year I left with 7 (see it really is bigger). The biggest takeaway was just how fast things are changing. The change wasn’t just about the advancements (and WOW! are there advancements), but also by how much the best practices of just a year ago are now primary examples of what not to do. This is not a set it and forget it strategy, nor is it one where you can count on success by looking at how someone else is doing it and copying them. By the time you copy them, they’ve probably started doing something new. As Trish Bertuzzi says in her new book The Sales Development Playbook, “Variables matter.” Sales development is a crucial function and one deserving of significant executive focus; lest you fall behind. Account based marketing is the rage today, and it was the hot topic at the conference. As inbound and content marketing strategies are mainstreaming (and prospects are getting download fatigue), few businesses can rely on organic lead generation alone. If game-changing growth is your objective, or if you’re aiming to grow large size accounts, you simply cannot wait for the right people to find you (even if you’re a great inbound marketer). Account-based marketing (ABM) flips the funnel and takes an account/company-focused approach rather than a lead-centric one. Successful ABM requires more sophistication than simple inbound or outbound. The good news is the tools that have been introduced in the last year to support the effort are both plentiful and powerful. If your growth team isn’t talking ABM, you’ve got some catching up to do. Last year’s theme focused on volume and cadence of outreach. Success was heavily a numbers game. You could succeed with brute strength. Not anymore (using a Peter Sellers accent). So many people have copied the email templates used by the pioneers, and the volume of email (132 billion B2B emails a year) has exhausted our prospects and they’re simply not responding anymore. This year’s theme was about quality, split testing and personalization (more on that below). This means that if you’re not implementing a dedicated prospecting effort now, your learning curve will just be that much steeper when you realize you need to. Last year was an interesting experience. 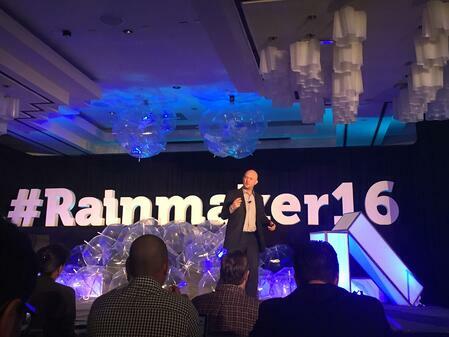 When people at Rainmaker 15 learned of our inbound and content background, they looked at us as though we were aliens. This year, every keynote speaker discussed the importance of content in driving outbound results. While this is good news, it means that the volume of content is only going to increase and therefore practitioners will need to meet a higher threshold to bear results. If the importance of content wasn’t music enough to my ears, the acknowledgement of the blurring lines between sales and marketing was like another Bruce Springsteen concert for me. Sales and marketing alignment is quickly moving from an advantage to table stakes. Don’t wait to address this crucial area, regardless of your growth strategy. Content is the new spam. Simple templated emails bore everybody. There’s more noise than ever. The question is how do you break through? The answer is personalization. While there is complete agreement about the importance of personalization, and there were some great examples of personalization done right (shout out to John Barrows presentation and his portal), the biggest challenge in demand generation is clear. How to successfully deliver personalization at scale. The good news is the challenge is now clear. The bad news is that no one has a clear answer. I’m sure this will continue to be a challenge for some time. Kudos go out to Kyle Porter, Tami McQueen and the entire SalesLoft team for bringing together such a powerful slate of practitioners, for building a powerful product and leading in the development of the ecosystem to support the strategy and for building such a strong community. I’m looking forward to what they bring over the next year. As I finish this post, one final takeaway comes to mind. While there has been tremendous progress in sales development efforts, everyone is still trying to figure out demand generation in this day and age. Anyone who tells you they’ve got it down is lying. That’s good news for those who have jumped on board. However, here is a word of caution. We implement these programs across an entire client base, so when we launch a program for a client we are not starting at step one, and have a strong process we can rely on. That said, there is always a steep learning curve in making the process work for a specific client. As I wrote earlier, “variables matter.” And the learning curve is only getting steeper. Now is the time to learn and stumble. Over the next couple of years, the distance between those that have been stumbling the last couple of years and those that aren’t trying will grow exponentially. That’s not to say time is running out, but it is (I hope) a strong push on urgency to build your growth engine to succeed in the world ahead, and not the one that we’ve left behind.